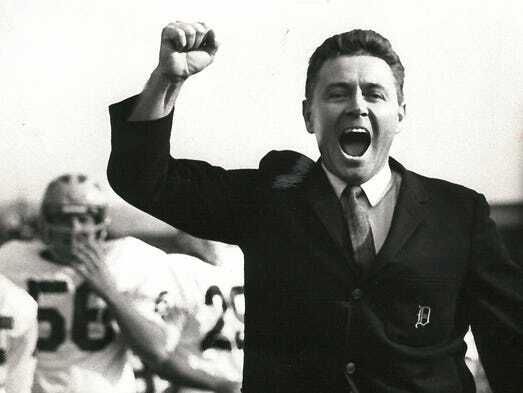 When I heard the news Tubby Raymond, legendary Delaware head football coach, died last week at the age of 92, two immediate memories came rushing back to me. One occurred on October 16th, 1999, when Tubby had made a complaint to the local paper or radio in the run-up to Kevin Higgins‘ Mountain Hawks beating his Blue Hens on Delaware’s homecoming, 42-35. I have no idea if the quote even actually happened, but my recollection is that Tubby said that Lehigh had “St. Bartholomew’s” on their schedule, and hadn’t played anybody. It was a verbal jab that many Delaware fans took with them to the stands to heckle the Mountain Hawk fans that made the short trip to Newark. Up until that point, I had watched a bunch of Lehigh football games over the years. I experienced their rise in the 1990s. I enjoyed wins, and championships, and playoff victories. The other memory that came rushing back was the run-up to Delaware’s home I-AA playoff football game a year later. I remember the visceral excitement that I had that Lehigh was going to have a chance to beat Delaware twice in two years at their place. And I was looking in the newspaper for what Tubby Raymond had to say about Lehigh. Nothing. And Tubby’s 2001 team simply shut up, and hit Lehigh in the mouth repeatedly in a 47-22 rout that wasn’t as close as the final score might indicate. When RB Antawn Jenkins dove over a Lehigh player into the end zone to punctuate Delaware’s 33rd unanswered point after Lehigh briefly went up 10-7, I felt like I was smashed in the mouth, and I wasn’t even suited up. And that was Tubby Raymond, in a nutshell to Lehigh players, coaches and fans – a mixture of competitive verbal needling (that sometimes cut close to the bone), enough so that you wanted to see him beat more than any head football coach in America. He tended to back up the talk with excellent teams – when Lehigh teams beat Delaware, these were not ordinary wins – they were gems, and when the Mountain Hawks lost to his teams, they were crushing. And then, when the clock read 0:00, win or lose, Tubby would say something that made it hurt just a little bit less, allow you to regroup, and make you want to circle Delaware on the schedule for next year. I never had the honor of meeting Tubby Raymond, but he had an awful lot to do with my passion for Lehigh football, and for that I am grateful for him.